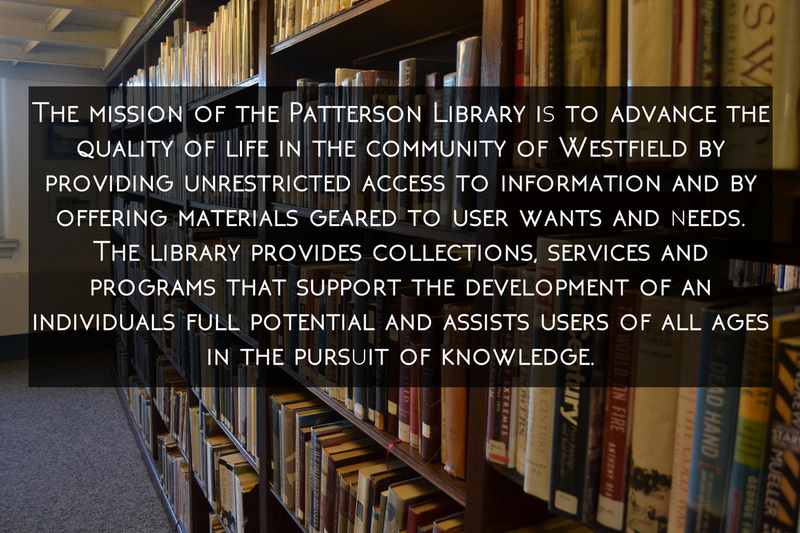 "I will and bequeath one hundred thousand dollars to found a library in the Village of Westfield to be called the Patterson Library, and dedicated to the memory of George W. Patterson and Hannah W. Patterson, his wife. 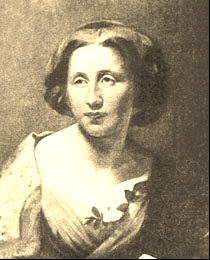 This I leave in the hands of my brother, George W. Patterson, who will see that my will is carried out." Miss Patterson's brother and executor, George W. Patterson, Jr., joined with other members of the Patterson family to create an endowment and form a corporation to be known as the Patterson Library. The University of the State of New York chartered the library on March 19, 1896. To allow the funds from the endowment to be invested so that a proper building to house the library be erected at a later date, the library made use of a home owned by the Patterson family at 58 South Portage Street rent-free for a period of ten years. This structure now houses the YWCA of Westfield. The Patterson Library at 40 South Portage Street opened its doors to the public on July 1, 1897, with 6,320 titles, 5,000 of which were those recommended by the American Library Association Model Library displayed at the Chicago World’s Fair in 1893. A sampling of the original collection is now a part of the library's archives. The circulation for the first year the library was open totaled 20,458 volumes, higher than the most optimistic estimates made at the time. The library staff in place to greet an enthusiastic public included Mrs. Frances D. Patterson, librarian; Miss Katherine Mack, associate librarian; Miss Bertha Royce, assistant; and Miss Emma Piehl, assistant librarian. The indomitable Miss Piehl succeeded Mrs. Sarah Hewes Ames as librarian in 1919 and remained with the library until her retirement in 1950. The collection increased, as did the building fund. Unfortunately, George W. Paterson, Jr. died in 1904 and did not see the fruits of his labors on behalf of his sister and community. His son-in-law, Frank W. Crandall, treasurer of the library, carried through on Hannah's wishes. On July 11, 1905, ground was broken for the new building on land bequeathed to the corporation by George W. Patterson, Jr. Architect E.E. Jarolemon of Niagara Falls, NY, designed the building and the contractors were Morris and Allen of Buffalo. The building is still one the jewels of architecture in the region and was built at a cost, including equipment, of $90,000. Modeled after the Erechtheum in Athens, the building was designed in a style known as Academic Revival or Beaux-Arts Classicism of gray brick and white marble with a cut stone foundation and basement, the library was built on a radial plan, exactly symmetrical. The entrance is recessed behind four columns with Ionic capitals. The windows are topped with pediments and flanked with pilasters also with Ionic capitals. The curved surface of the rear of the building has a pattern of windows and pilasters with a continuation of the white bands of stone against the light brick. A colonnade of stone pillars supported by field boulders with cut stone coping encircles the building forming a pergola with a grassy terrace and a trellis for vines. Eight massive Corinthian columns with cornice and entablature support the beautiful interior central dome. The plaster decoration of the ceilings and walls in the rotunda and reading rooms are of plaster of Paris. The library's main desk is located in the rotunda with octagonal reading rooms beyond. The original balcony floor was of glass. The interior is enhanced by beautiful green-brown oak and marble. Fireplaces graced the reading room and children's room. Stained glass skylights in the rotunda and the reading rooms added distinction to the ceiling. Chandeliers of bronze and iridescent favrile glass made in the Tiffany studio in New York enhanced the beauty of the design. The furniture and equipment came from the Library Bureau of New York and were custom designed for the new building. Patterson Library was dedicated on August 1, 1908. The audience was welcomed by Dr. George Washington Patterson III, vice president of the library, who presented the dedication address and introduced the speakers: Harlan L. Munson, president of the Village of Westfield, who responded and accepted the full and free use of the Patterson Library on behalf of the citizens of Westfield, and Dan George Edgar Vincent, Ph.D., the president of Chautauqua, who also delivered a dedicatory address. Throughout the years, the library building has been superbly maintained and its beauty preserved. Visitors still delight in the splendor of the library’s rotunda with its magnificent columns. The wood is as stunning as it was on dedication day. Interior painting using a custom color design has further enhanced the building’s fine features. A major capital campaign with a goal of $450,000 begun in 1993 culminated in a building project in 1994 to provide access for all in compliance with the Americans With Disabilities Act. Included in the annex are automatic doors, a wheelchair lift, and new restroom facilities. An elevator was installed in the old stairwell of the existing building. In 1996, staff offices were moved to their original location in the south alcove to restore shelving in the rotunda area and make an appropriate environment for library automation. The library computerized its catalog, circulation procedures and patron records in 1997. The year 1999 witnessed the completion of a renovation to the lower level, which provided a state-of-the-art children’s room named Patterson Park planned by architect David Walter of Habiterra in Jamestown and Tim Benson of Jag Teckna in Erie, PA. National recognition for the design of Patterson Park took the form of a photograph in Library Journal’s December 2000 architectural issue. Due to the hard work of the library’s volunteer men’s group named the “Hands” led by Building Committee Chair David Correll, two archival rooms have been developed off the mezzanine to house the library’s most precious and rare collections. Gone, however, are the unique glass floor of the balcony, the stained glass skylights and the grand Tiffany chandeliers, save two, one in the library’s lower level and another in the main entrance. The library also possesses many notable collections. A splendid collection of World War I posters may be viewed in the new annex. Nineteenth century oil portraits of the Patterson family have been restored and are proudly exhibited in the library’s main reading room. The library owns several other portraits of prominent Chautauqua County residents painted in the 1800.s that are on loan to the Chautauqua County Historical Society. An astonishing collection of seashells from the collections of John D. Patterson and the Rev. Rueben Tinker are on display. There are over 300 varieties of shells in the collections including two rare golden cowries. A rock and mineral collection of Arthur Macer and G.W. Patterson is housed in the archives. A seven-foot sailfish was given to the library by H. H. Meyer. A display of stuffed animals completed in the early 1900s by Westfield native H.W. Mossman graces the library. A spectacular ninety-specimen mounted bird collection formerly owned by John D. Patterson and including a rare passenger pigeon is also housed in the library. The millstones in front of the library building owned by John McMahan ground the first grain taken to mill in Chautauqua County. January, March, May, July, September, and November at 7:00 p.m. at Patterson Library.